Sterling silver, Turquoise, Brown Shell, Purple, Red and Orange Oyster Shell. 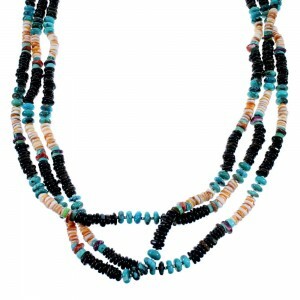 The necklace measures approximately 29-1/8" long. The necklace weighs 151 grams. If you want to add something to your jewelry collection, take a look at this stunning necklace! 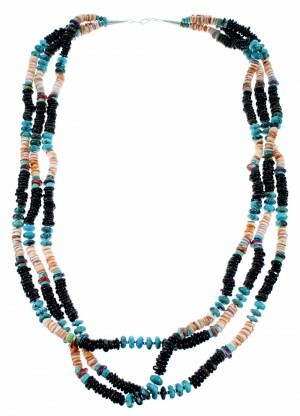 This piece of Native American jewelry is Navajo hand strung out of genuine sterling silver and real multicolor beads. 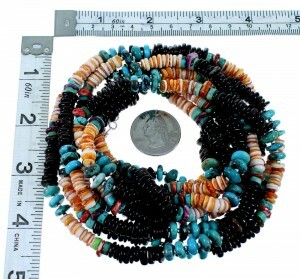 The necklace is made up of THREE strands that consist of: 2-mm Silver round beads, 4-mm Turquoise rondelle beads, 6-mm Turquoise wheel beads, 8-mm Turquoise rondelle beads, 6-mm Oyster Shell rondelle beads, along with Brown Shell, Purple and Red Oyster Shell free formed beads that have an average measurement of 8-mm. The necklace can be worn one of two ways, loosely around the neck or slightly twisted for an additional fashion statement. 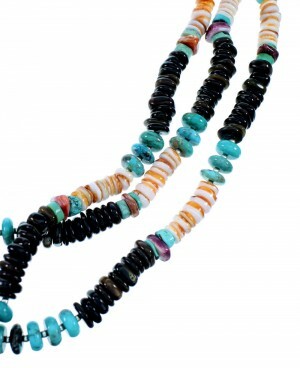 Each end of the necklace is completed with a silver cone for a stunning look. The cones are stamped sterling.